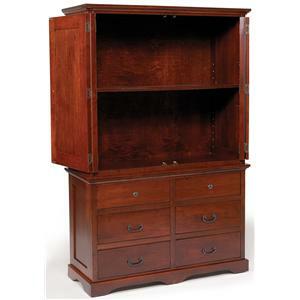 This elegant armoire carries a beautiful air of tradition. Its unique molding and shaped legs bring a fresh life to the bedroom. Two large upper doors conceal ample storage space as do its three lower drawers. 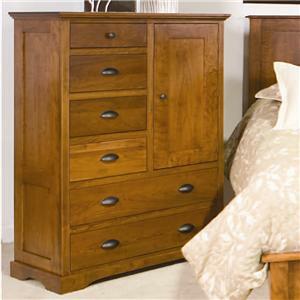 With prominent crown molding and a chest on chest appearance, this traditional armoire is sure to create classic appeal. 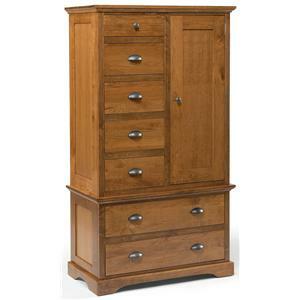 The Elegant River Bend Armoire with 2 Doors by Millcraft at Saugerties Furniture Mart in the Poughkeepsie, Kingston, and Albany, New York area. Product availability may vary. Contact us for the most current availability on this product.